Pretty Good Looking, Isn't It? Here is the yarn (to the left) I picked in January—The Calzetteria is almost a sports weigh-the Red Heart is a real light weight—but I do have some heavier (almost sport weight white I can/will sub) The real issue I have with the Calzetteria is the weight--threading the beads on will be a real PITA. 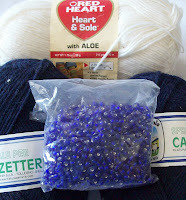 And well the color (a lovely shade of navy) is nice--but its much darker than the beads. The first try at a dark blue was too light, and these skeins are darker—but still too light. 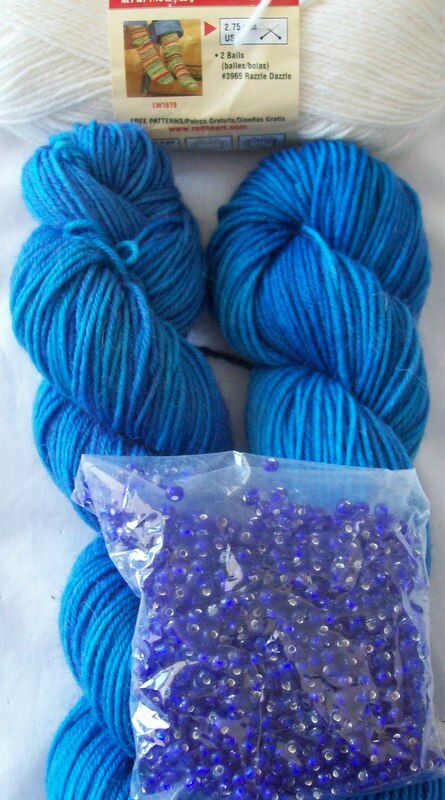 The color I really want is this more like this --The small painted box in between the two yarns and behind the beads. (too bad is spray paint and not yarn!) lighter than navy (yarn) but darker than the newly dyed skeins--its a bit too dark, but its still closer to what I want. So I have a few choices.. I can re-dye (again!) the blue, and try for a darker shade—maybe add a bit of black to the blue dye—maybe a bit more purple, too. Or maybe I can check out the hobby stores and find a pack of beads in the RIGHT shade (or closer to the right shade of blue! Or I could skip the beads all together, and just make the socks with out them. I have some other sock yarn—and a set of beads that is much closer match—so maybe I should just wait, (and think about it). 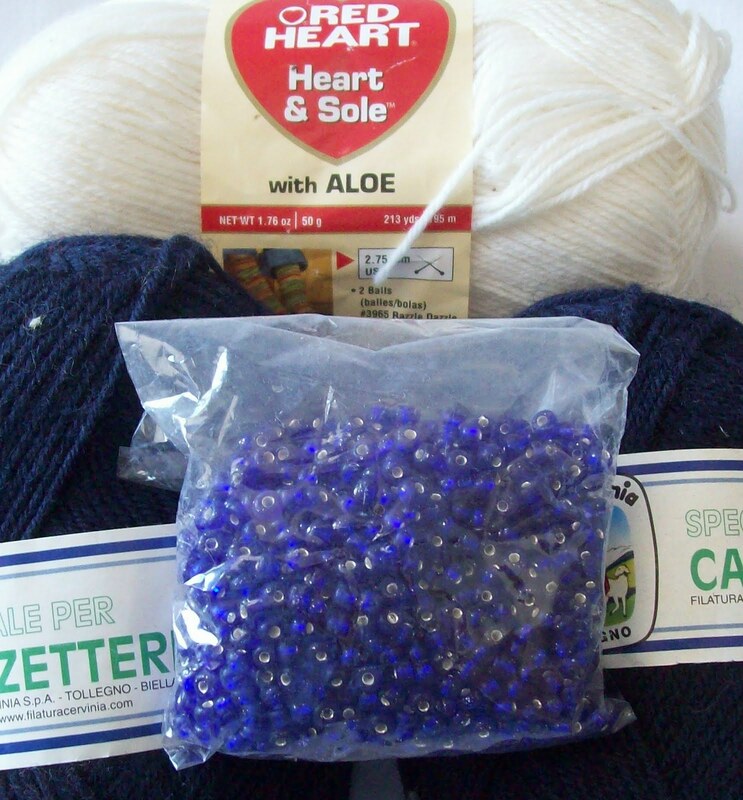 The other sock yarn is not a solid, (nor are the matching beads a single color). There are lots of ways I can use beads in socks, but this other set of yarn and beads in not really suitable for the Swirl sock I envisioned with beads. I have choices.. Lots of choices! Especially since (see that * above?) I was forced (by way of a coupon sale) to buy some (Um it really doesn't count as stash, right?) sock yarn yesterday. One set (2 skeins) are a great match for lots of wardrobe items (and really just beautiful!) the other skein (a 100gm double skien) is just the right color for an other pair of socks that was added to the list. Orange Pekoe socks were one of the first REAL socks I designed --before that, my socks were plain generic (stocking knit) socks or generic ribbed socks. And while I have some new home made sock club sock kits made up—one sock idea has been nagging me--Crazy Eights-- a pattern which is morphing and changing (slightly), becoming more specific and detailed--and will likely have a name change as a result. I love how I imagine it.. and many, many years ago, I did something similar (Jump rope socks) Tese socks are going to take a bit of planning--finding the right scraps, the right mix of solids, semi solids and patterning yarns. And Really 8 colors in a row? Insane! 2) documenting all of the details to make them repeatable! Hat idea are peculating too.. Cotton hats, and lace hats, shaped hats and felted hats. Some have spawned ideas for matching fingerless gloves, others for scarves (What an other scarf?) and well what can I say? I've been ill (not seriously) and fevered—and getting a fever is like lighting a fire—my brain cooks up ideas 1000 times faster than I could ever hope to knit!